I called it the day before the playoffs started. I’m claiming it. My boys will corroborate it, and you heard it here first. When it comes to sports, I’m a generally knowledgeable dude. Much more so than the average cat. But I can’t tell you whether the 6th man the Lakers is a better on-ball defender than the reserve point guard for the Jazz. I don’t have that level of insight. What I do have is a good sense of judgment, peppered with some strong biases. In this case, in the interest of disclosure, I have to tell you that I grew up in “the 313”, and I’m a die-hard fan of everything Michigan. That includes its greatest pro athlete: Isiah Thomas. He’s my favorite player of all time. That’s right: cheek-kissing, Daisy Duke-wearing, walk off the court instead of shake your hand Isiah. Oh, he’s also two-time NBA champion, 50 Greatest of All-Time, stab you in the eye and violate your favorite play-cousin to win the game for his team Isiah. That dude who sunk the CBA, mismanaged the Toronto Raptors, and single-handedly ran the NBA’s premiere franchise into oblivion? I don’t know who you’re talking about. So why do I think the Pistons and the Hornets will play in the finals? And what does that have to do with a man who played his last game as a Piston in 1994? 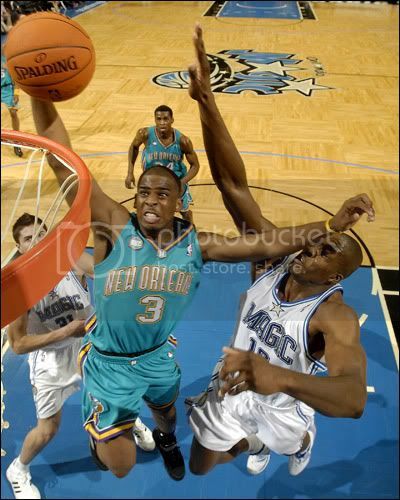 The answer is Chris Paul. For the video game heads: he’s Isiah Thomas 2k8. He’s got the baby-face that belies his fire, the ability to get to the rack when it looks like the other team has eight men in the paint, and that video game-type handle that rocks and re-rocks defenders into splitting in half like Megtron did Jazz. He’s also got the Spurs on the ropes, and the ability to ultimately get his team into the NBA finals. And when he gets there, Isiah’s old team will be waiting for him. And just like Isiah, he’s going to have to lose in his first NBA finals appearance before he gets his first ring. Huey Speaks – on Sean Bell??? HEY MO’ I AGREE WITH YOUR COMPARISON OF CP3 AND ZEKE AS PLAYERS. BUT, THE PISTONS NEED TO WIN THE EAST AND BEAT THE C’S BEFORE WE PUT THEM IN THE FINALS! 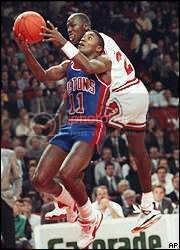 AS FOR ZEKE, I LOVED HIM AS A PLAYER, BUT WHEN HE WALKED OFF THE COURT AFTER THE BULLS BEAT THAT A**, I LOST ALL RESPECT FOR HIM AS A MAN……JOE DUMARS WAS THE CLASS ACT OF THAT TEAM AND HE SHOWED IT….TAKE CARE AND WE’LL TALK WHEN THE FINALS BEGIN…..
Lakers deserved to win this year, hands down. and not cause I’m a big fan of Bryant 🙂 They were the best.